If you are searching our connectors page for the Google Optimize logo, you won't be able to find it. Google doesn't have an API available for this particular data source, so we had to get creative. Using the Google Analytics connector + the Query Builder, you can gain access to data from two Google Optimize metrics. 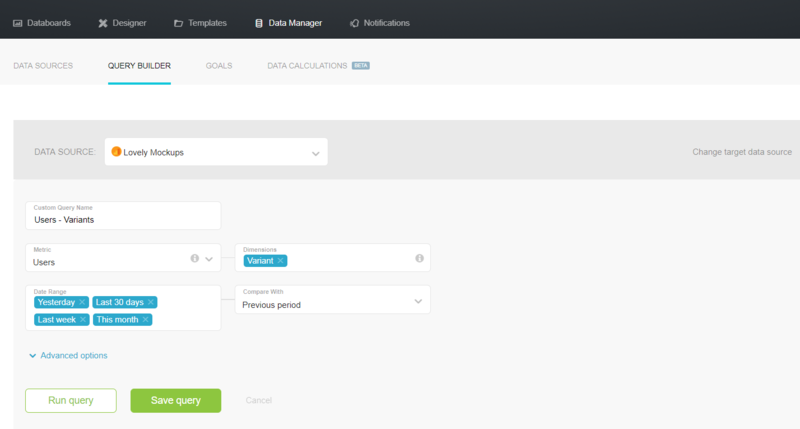 Navigate to the Query Builder section from the submenu of the Data Manager page. Click on the "+New query" button in the top right of your screen. Select your Google Analytics data source. Choose the metric you would like to see via the Metric dropdown. Choose either Experiment ID and Variant from the dimensions dropdown list. Choose your desired Date Ranges, Compare With value, and Advanced Query Options. Run Query. Make any necessary changes and s ave the query. Open databoard in the Designer tool. Pull in a datablock. In the righthand properties panel, select Google Analytics as the data source. Click on "+ Create custom metric" or "+New Custom Query" in the metric section of the properties panel. 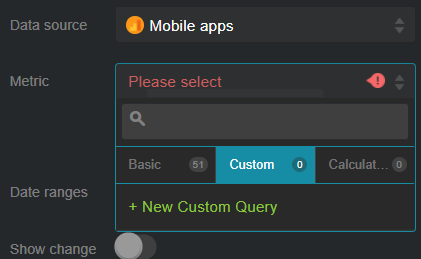 Inside the custom query window, choose Google Analytics as the data source. Make any necessary changes and save the query. You may notice that the data your custom query generates isn't in the correct format to be beneficial to someone viewing the report. For this reason, you may want to rename certain dimensions. The best practice is to rename a dimension before you save the query. To rename a dimension, click the "..." icon next to "Dimension" in the Data Preview, and then select "Rename dimensions." Whenever this dimension is identified, it will be replaced by your specified name. That's it! Your query is ready to be used in a databoard. If you will have any additional questions, feel free to contact our support team.